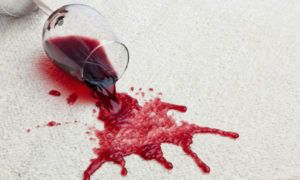 Wine stains can be challenging to remove for a home owner. Especially if the carpet is nylon and the spill is in a high traffic area. All wall to wall carpet today has a manufactured applied stain blocker. This stain blocker wears off over time and high traffic areas are the first to show this. The best thing you can do is to immed iately blot as much liquid as possible. If the liquid has penetrated the carpet pad, you will need sub surface extraction. This is a process where a stain can be removed from the carpet pad without removing the carpet. See my post on Eliminating Dog and Cat odor to see sub surface extraction. When it comes to removing the acid dye stain that is left over after extraction, one of two processes is required: topical application and/or heat transfer. Although topical application of a professional cleaning agent is self explanatory, the heat transfer method requires a commercial grade steamer and a little skill and patience. In most cases, 90% to 100% of the stain can be removed.